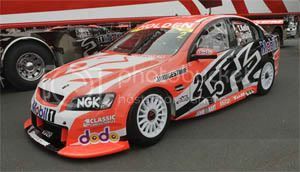 The VE Holden Commodore is an all-new platform introduced to replacing the ageing 2004 VZ. The sedan models were released in August 2006, with the WM Statesman/Caprice released in September replacing the WL model. VE Ute models were revealed 22 August 2007, and were on sale October 2007. VE models given an MY09 update in March 2008. VE Sportswagon models released in July 2008. VE MY10 released in September 2009. Omega, 3.6L, V6, Sedan/Sportswagon, 180kW@6000rpm, 330Nm@2600rpm. $34,490. (till Nov 2008). Omega, 3.6L, V6, Sedan/Sportswagon, 175kW@6500rpm, 325Nm@2400rpm. $37,290. (from Nov 2008 MY09.5). Omega, 3.6L, V6 LPG, Sedan/Sportswagon, 175kW@6000rpm, 325Nm@2600rpm. (till Nov 2008). Omega, 3.6L, V6 LPG, Sedan/Sportswagon, 175kW@6500rpm, 318Nm@2400rpm. $39,690. (from Nov 2008 MY09.5). SV6, 3.6L, V6, Sedan/Sportswagon, 195kW@6500rpm, 340Nm@2600rpm. $39,990. SS, 6.0L, V8, Sedan/Sportswagon, 270kW@5700rpm, 530Nm@4400rpm. $44,990. SS V, 6.0L, V8, Sedan/Sportswagon, 270kW, 530Nm. $51,990. Berlina, 3.6L, V6, Sedan/Sportswagon, 180kW, 330Nm. $39,990. (till Nov 2008). Berlina, 3.6L, V6, Sedan/Sportswagon, 175kW, 325Nm. $40,790. (from Nov 2008 MY09.5). Berlina, 3.6L, V6 LPG, Sedan/Sportswagon, 175kW, 325Nm. (till Nov 2008). 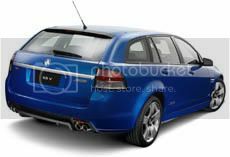 Berlina, 3.6L, V6 LPG, Sedan/Sportswagon, 175kW, 318Nm., $43,190. (from Nov 2008 MY09.5). 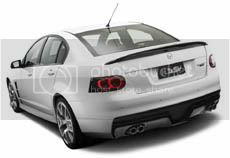 Berlina, 6.0L, V8, Sedan/Sportswagon, 270kW, 530Nm, $44,990. Calais, 3.6L, V6, Sedan/Sportswagon, 195kW, 340Nm, $45,490. Calais, 6.0L, V8, Sedan/Sportswagon, 270kW, 530Nm, $50,490. Calais V, 3.6L, V6, Sedan/Sportswagon, 195kW, 340Nm, $53,490. 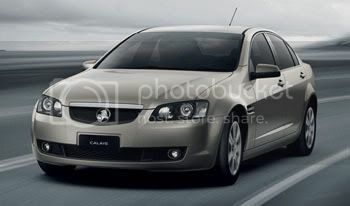 Calais V, 6.0L, V8, Sedan/Sportswagon, 270kW, 530Nm, $58,490. Statesman, 3.6L, V6, Sedan, 195kW, 340Nm, $58,990. Statesman, 6.0L, V8, Sedan, 270kW, 530Nm, $62,990. Caprice, 3.6L, V6, Sedan, 195kW, 340Nm, $65,990. Caprice, 6.0L, V8, Sedan, 270kW, 530Nm, $69,990. Omega, 3.6L, V6, Utility, 180kW, 330Nm. $30,990. (till Nov 2008). Omega, 3.6L, V6 LPG, Utility, 175kW, 325Nm. (till Nov 2008). SV6, 3.6L, V6, Utility, 195kW, 340Nm. $35,990. SS, 6.0L, V8, Utility, 270kW, 530Nm. $39,990. SS V, 6.0L, V8, Utility, 270kW, 530Nm. $44,990. HSV revealed in August 2006 in VE trim with LS2 V8 engines. E Series MY09 released in May 2008 with 6.2L LS3 V8 engines.Tourer model released October 2008. Clubsport R8, 6.0L, LS2 V8, Sedan, 307kW@6000rpm, 550Nm@4400rpm. $62,890 (till May 2008). Clubsport R8, 6.2L, LS3 V8, Sedan, 317kW@6000rpm, 550Nm@4600rpm. $64,550 (May 2008). Clubsport R8 Tourer, 6.2L, LS3 V8, Wagon, 317kW, 550Nm. $65.990 (Oct 2008). Maloo R8, 6.0L, LS2 V8, Utility, 307kW, 550Nm. $59,990 (Oct 2007, till May 2008). Maloo R8, 6.2L, LS3 V8, Utility, 317kW, 550Nm. $61,550 (May 2008). GTS, 6.0L, LS2 V8, Sedan, 307kW, 550Nm. $74,990 (till May 2008). GTS, 6.2L, LS3 V8, Sedan, 317kW, 550Nm. $76,990 (May 2008). Senator, 6.2L, LS3 V8, Sedan, 317kW, 550Nm. $69,990 (April 2009). Senator Signature, 6.0L, LS2 V8, Sedan, 307kW, 550Nm. $76,990 (till May 2008). Senator Signature, 6.2L, LS3 V8, Sedan, 317kW, 550Nm. $79,190 (May 2008). Grange, 6.0L, LS2 V8, LWB Sedan, 307kW, 550Nm. $82,990 (May 2007, till May 2008). Grange, 6.2L, LS3 V8, LWB Sedan, 317kW, 550Nm. $84,690 (May 2008). W427, 7.0L, LS7 V8, Sedan, 375kW@6500rpm, 640Nm@5000rpm. $155,500 (July 2008). Nickel, Impulse, Odyssey, Evoke, Ignition, Crema. * As at introduction of VE model, August 2006. Commodore V-Series- upgrade on Omega model (October 2006). 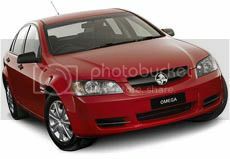 Commodore Lumina- special edition model, A$32,990 (June 2007). HSV Clubsport R8 20th Anniversary- upgrade on Clubsport R8 (October 2007). Calais V International- upgrade on Calais V model (November 2007). 60th Anniversary Edition- Sedan: $33,600; Ute: $36,990 (from April 2008). HSV 40th Anniversary GTS- Only 100 units (AIMS, October 2008). HSV Senator Signature SV08- Only 50 units (AIMS, October 2008). HSV Senator- Limited edition, 30 manual, 59 auto, $69,990 (MMS, March 2009). Commodore International- upgrade on Omega A$34,490 (June 2009). HSV Grange- Preview of production model. (AIMS Oct 2006). 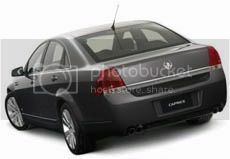 Commodore Sportswagon- Calais V-guise preview of production model. (AIMS Oct 2007). Holden Coupe 60- 6.0L V8 coupe, celebrates 60 years of Holden. (MMS Feb 2008). HSV W427- LS7 7.0L V8, 370kW, 640Nm, in Panorama Silver, pre-production model. (MMS Feb 2008).